Out in the wide expanse of Jordan’s terrain is a city that was once lost to time. A city cut from the stone face of a deep and winding valley, Petra is a magnificent example of human ingenuity. Journeying through the rose-colored rock that surrounds and comprises the ancient city is a walk through the history of humankind. 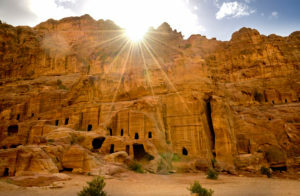 Considered to be one of the New Seven Wonders of the World, and a UNESCO World heritage Site since 1985, Petra is for the adventurous that wish to have life-long memories of another world. Thanks to G Adventures, we’ll learn all about it in today’s 60-Second Geography. Abandoned but by a few nomads in the Byzantine Era following the Roman Empire, it was revealed to the rest of the world in 1812 by Johann Ludwig Burckhadt. Petra’s name comes from the Greek word “petros” for “stone” or “rock”. Though the city is spread out over 100 sq. miles, there is more than enough to see in the centrally located places. One of the most prolific structures is the Treasury, or Al-Khazneh. Al-Khazneh is the first structure the traveler will lays eyes upon after exiting the almost mile-long Siq, a winding path through a sandstone canyon. The traveler will immediately see the logic in it being named after the stone itself when they gaze upon the grand entrance. With columns and ledges carved from the flat face of a canyon, it stands at 131 ft. with a doorway made for giants at almost 20 ft.-tall. This impressive feat of architecture and ingenuity leads into the inner chambers, that are also large. A true walk into the past, the traveler will be in awe of the intricate façade and inner chambers. Once the traveler is ready to move on, the Street of Facades awaits them around the next bend. These facades are the front of more than 40 tombs and houses, some with entrances and others with false faces—all cut from the sandstone as well. Further down the Street of Facades is the Roman Theater, originally carved from the stone by the Nabataeans (original occupants of Petra) and enlarged later by the Roman Empire, which is a tiered theater that can hold up to 7,000 people. Across from the Roman Theatre are the Royal Tombs. These tombs are more grandiose and larger than the other tombs, and will astound the traveler’s senses with such a unique city. The largest and most legendary of the monuments is the Monastery, or Ad-Deir. The Ad-Deir can be found at the end of a stair-path comprised of 800 steps. Similar to Al-Khazneh, Ad Deir’s façade is a great display of carved architecture. 147 ft.-tall and 164 ft.-wide, The Monastery is completely worth the time and effort of the stair climb and will be a bookmark in the life of the adventurous traveler. Even with these fantastic sites, there are many more to see in the valley as it opens at the end of the Street of Facades. Petra is a wonder to be witnessed, a gem full of cool shadows amongst the harsh desert mountains. The traveler will love the adventure that awaits them in Jordan’s ancient beauty. 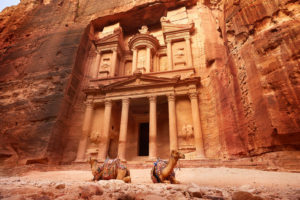 That’s why G Adventures is offering up multiple itineraries to the lost city of Petra. 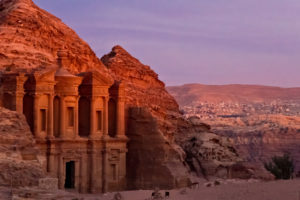 Whether through a short, week-long trip to Petra that is complete with a float in the Dead Sea or a more expansive tour of the surrounding area, G Adventures has the itinerary your traveler will want to experience in the land that exists beyond time.